We don’t know about you, but the minute our calendar turns over to the month of October, we feel overcome with the desire to start decorating for Halloween. 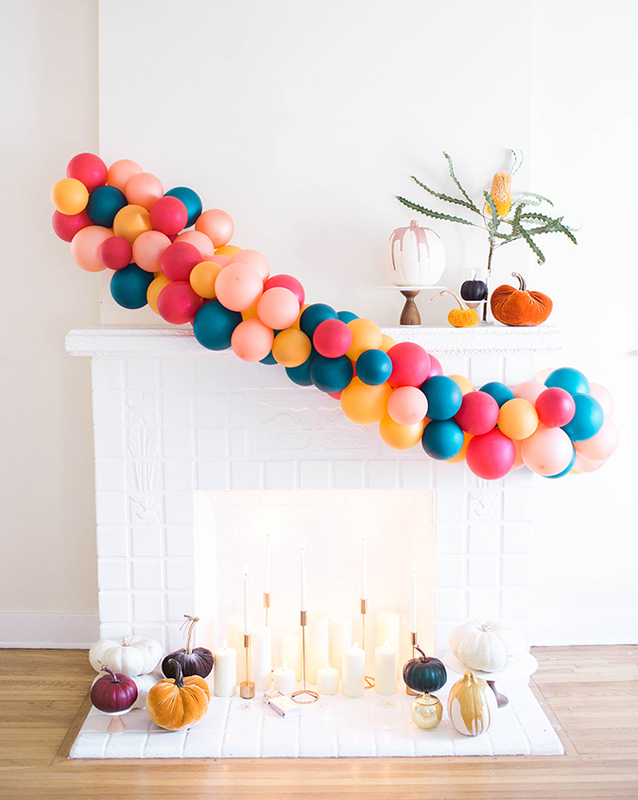 And when we say decorating, we mean transforming our homes into the chicest and spookiest of spaces, complete with pumpkins, faux spider webs, and trick-or-treat candy galore. Inspired by this recent post we did our friend and prop stylist Kate Martindale, today we are excited to kick off a brand new series with all of you today. We are proud to present the first holiday installment of our Mantle Makeover series, a new module within our DECORATE category that will showcase how we are revamping our mantle place each time a holiday rolls around. We think you are going to love it! For the first post in this new series, we’ve enlisted the help of two of our favorite pro stylists and party planners Royale of But First, Party! and Rachel of Bonjour Fête. These two ladies were the masterminds behind our vision, and truly transformed a clean blank mantle into a work of art. The mantle place is a great focal point of your living room to set the tone for the rest of your Halloween décor. 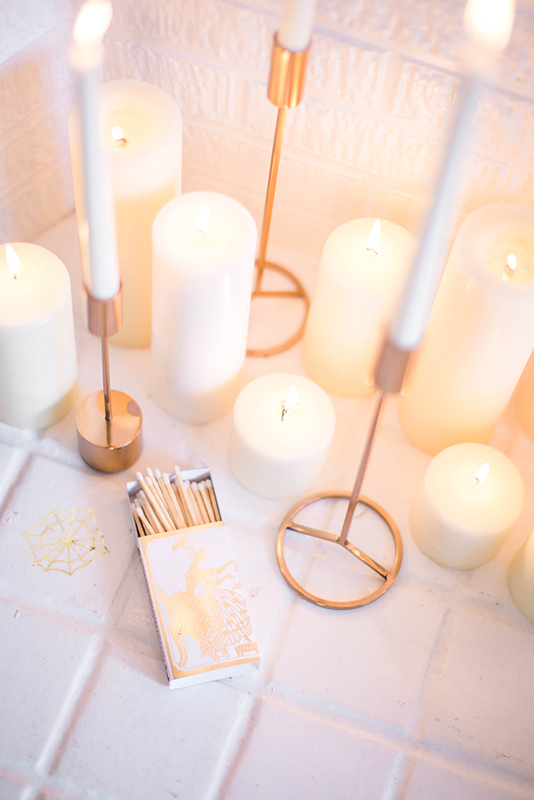 So, simply follow these tips to achieve this jewel-toned holiday look in your own home. 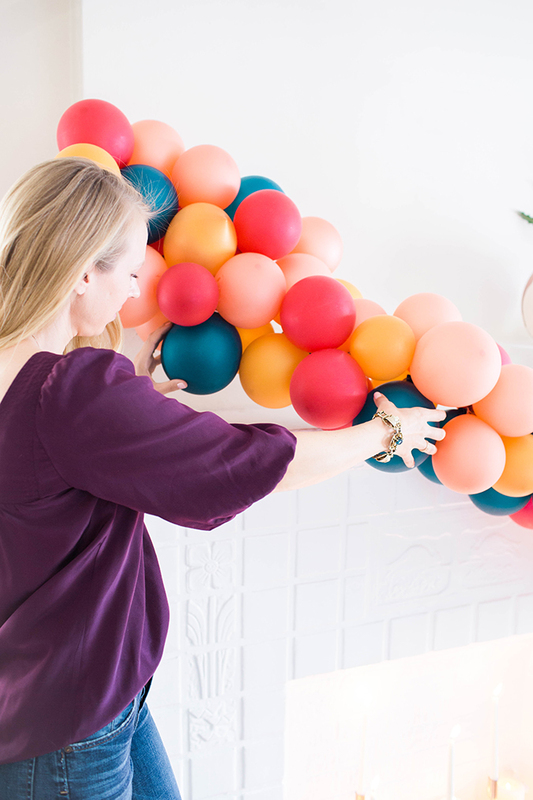 The first step Rachel and Royale took in making over our mantle was to create a color palette. 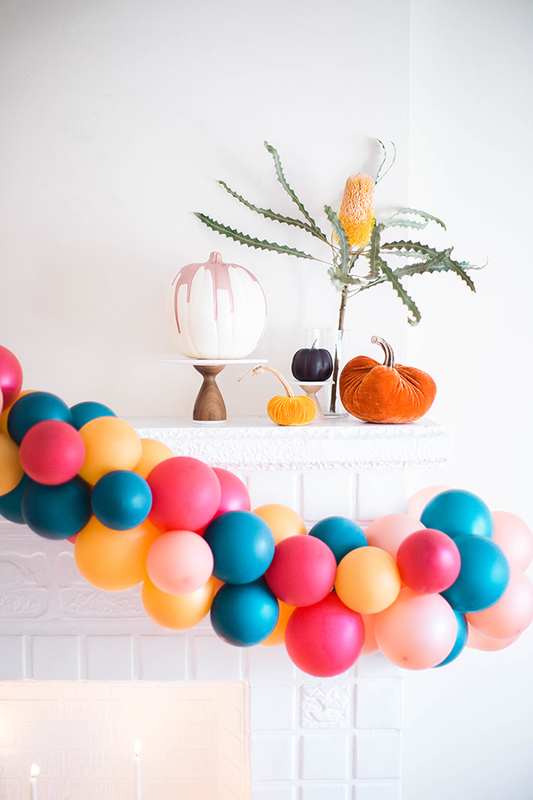 “We usually have one piece or one object we know we want to use that we are initially inspired by, and that object sets the tone of the entire look and color scheme.” In this case, the velvet jewel-tone velvet pumpkins (similar here) served as the initial inspiration for this vision. From there, the girls built an autumnal palette comprised of gold, rose gold, cranberry, emerald and a touch of aubergine. Your color palette will also be determined based on the space you have to work with. In a case like this where we had a blank canvas with the white fireplace, the sky was the limit. But when there are more wood tones or stone or tile features, it’s important to work around that preexisting palette. After the color palette has been solidified, Rachel and Royale recommend beginning your mantle set up, keeping varying heights in mind. 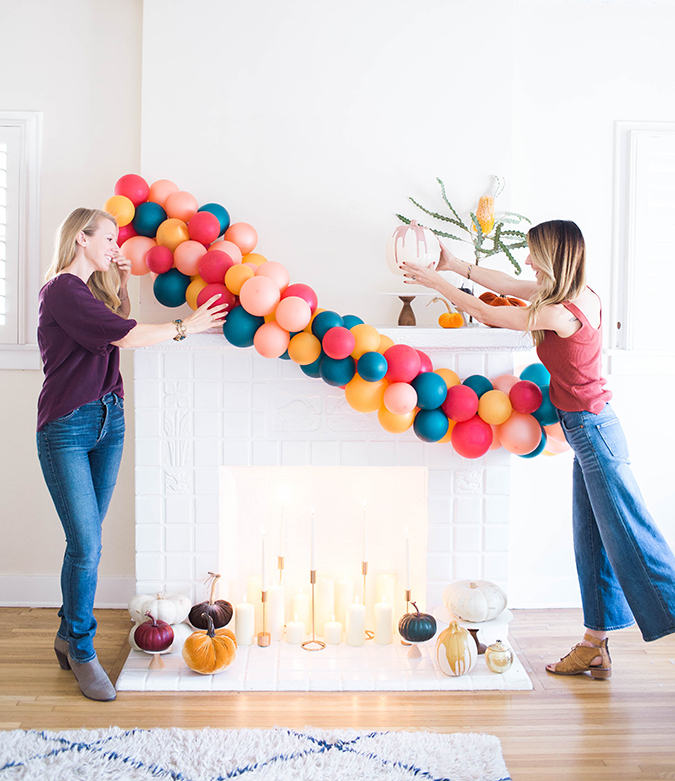 “We created a balloon garland going diagonally across the mantle to take the eye across the space.” (If you need helium tank for a similar installation, Balloon Time is a Team LC favorite.) Diagonal lines are great for adding the illusion of movement and height to a space that might not be super big. Tall plants like the one above can also add height and life to a mantle. 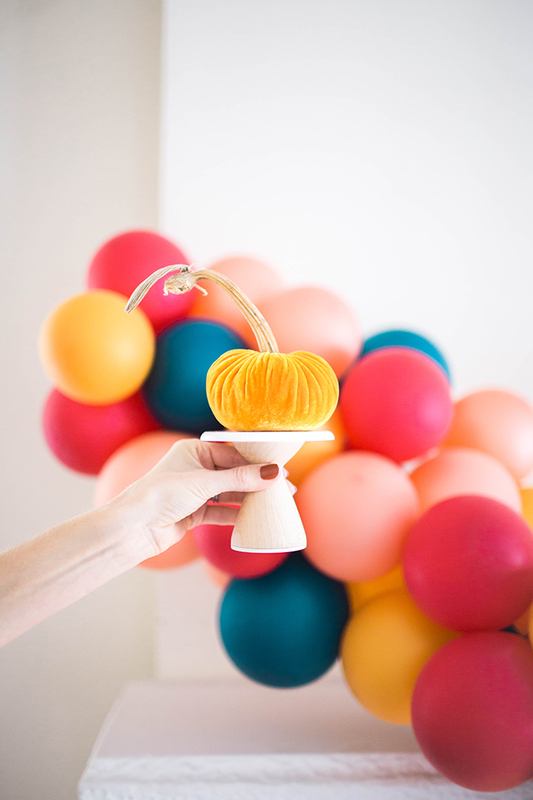 From there, they added different sized pumpkins—some of which were placed on cake stands for a unique display. They also mixed pillar and taper candles together in the fireplace. 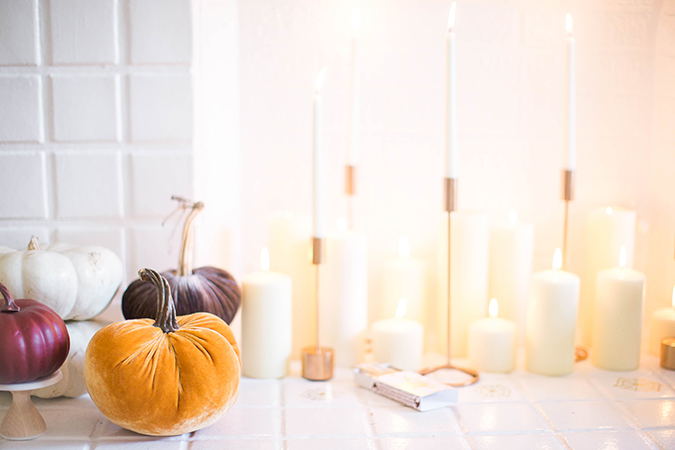 Using different sized pumpkin and different candle heights is a great way to achieve a cohesive look while keeping the area interesting. Lastly, one of Rachel and Royale’s biggest expert tips is to create balance but not symmetry. This means that you’ll want your mantle to look polished and balanced, but not too perfect. That might involve clustering more candles into one side of the fireplace, and having more pumpkins on the other side of the mantle. Whichever way you choose to do it, keep in mind that an asymmetrical yet balanced area is more interesting than one that’s perfectly symmetrical. Now that our mantle is ready to roll, all that’s left to do is plan a spectacularly spooky party! A big thank you to Rachel and Royale for making our mantle place look oh-so-chic. Be sure to check out all of the fabulous party décor on Bonjour Fetê by clicking here (you won’t be able to resist adding some to your cart! ), and read more about how to plan your next party with But First, Party! by clicking here. How will you be decorating your mantle place this Halloween? Stay tuned for more installments of our new series Mantle Makeover, coming soon. P.S. If you liked this post, be sure to check out Kate Martindale’s pink mantle makeover here, too.